11165+ web files, a regularly updated Gazetteer, overall an in-depth description of our island's internally self-governing British Overseas Territory 900 miles north of the Caribbean, 600 miles east of North Carolina, USA. With accommodation options, airlines, airport, actors, actresses, aviation, banks, beaches, Bermuda Dollar, Bermuda Government, Bermuda-incorporated businesses and companies including insurers and reinsurers, Bermudians, books and publications, bridges and causeway, charities, churches, citizenship by Status, City of Hamilton, commerce, communities, credit cards, cruise ships, cuisine, currency, disability accessibility, Devonshire Parish, districts, Dockyard, economy, education, employers, employment, environment, executorships, fauna, ferries, flora, former military bases, forts, gardens, geography, getting around, golf, guest houses, highways, history, historic properties, Hamilton, House of Assembly, housing, hotels, immigration, import duties, internet access, islands, laws, legal system and legislators, main roads, marriages, media, members of parliament, money, motor vehicles, municipalities, music and musicians, newcomers, newspaper, media, organizations, parks, parishes, Paget, Pembroke, performing artists, residents, pensions, political parties, postage stamps, public holidays, public transportation, railway trail, real estate, registries of aircraft and ships, religions, Royal Naval Dockyard, Sandys, senior citizens, Smith's, Somerset Village, Southampton, St. David's Island, St George's, Spanish Point, Spittal Pond, sports, taxes, telecommunications, time zone, traditions, tourism, Town of St. George, Tucker's Town, utilities, water sports, Warwick, weather, wildlife, work permits. Bermuda Trade Development Board postcard 1930s. Train on Front Street, outside what was then the Colonial Secretariat Building. Courtesy the late Joseph J. Outerbridge and Bermuda Trade Development Board (TDB), precursor of the Bermuda Department of Tourism. 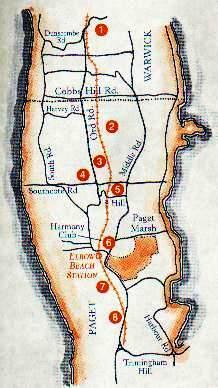 This map of the Bermuda Railway was issued by the TDB to mark the railway's October 1931 debut. 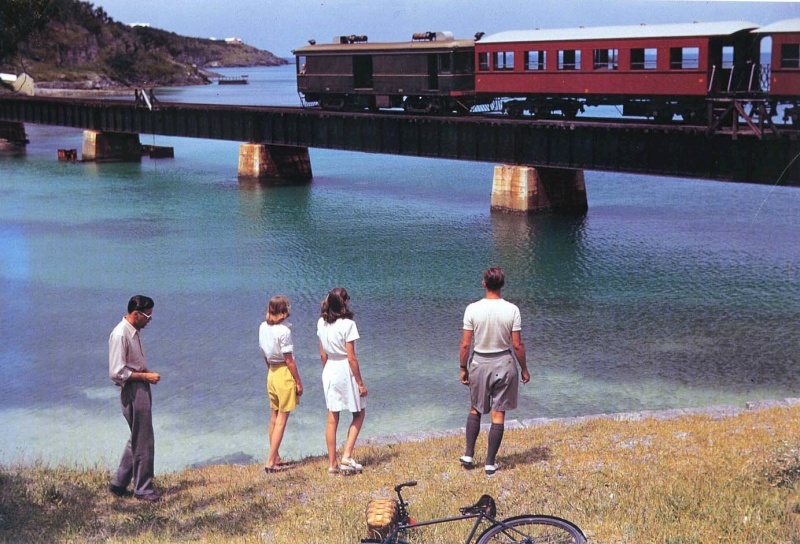 Bermuda Railway going over a coastal bridge, circa 1946, colorized B&W photo by M. B. Parker, used with non-transferable permission. 2019. February 22. The courts made the right decision yesterday when it ruled against the Government in a row over all-terrain vehicle tours in sensitive areas including the Railway Trail, the head of the environmental charity that brought the case said last night. Kim Smith, the executive director of Bermuda Environmental Sustainability Taskforce, said: “BEST is pleased that the decision of the Chief Justice emphasizes the need for full and proper evaluation of development proposals by way of the established planning processes.” She was speaking after Chief Justice Narinder Hargun quashed a decision to allow ATV tours in the West End. The judge said that Lieutenant-Colonel David Burch, the public works minister, had “assumed that planning permission was not required” when he granted approval for the tours on the Railway Trail, Fort Scaur Park and Hog Bay Park. He added: “In my judgment that was an erroneous assumption and amounted to an error of law. The minister, as the decision-maker, is required to properly address himself in relation to relevant legal issues and failure to do so will result in the decision made being set aside on an application for a judicial review. The minister’s decision announced on March 16, 2018, in relation to Mr Hollis’ proposal to operate ATV tours is hereby quashed.” BEST’s legal costs will be covered by the Government. Ms Smith said: “Our park lands are for the enjoyment and benefit of locals and visitors alike and must be protected for current and future generations. While BEST supports entrepreneurial initiatives, we are not satisfied that there is an overriding public interest in allowing ATV tours that outweigh the potential harm and damage to our national parks.” Ms Smith added: “The decision highlights the need to attain planning permission for significant development proposals such as this. Potential impacts on our environment must be evaluated prior to permissions being granted. Best supports this.” Bill Zuill, the executive director of the Bermuda National Trust, also welcomed the Chief Justice’s decision. Mr Zuill said that BNT joined the case brought by BEST “because we believed that granting approval of the tours without the necessary due diligence ... would set an extremely dangerous precedent and threat to our national parks”. He said that for a project as “significant and as complex” as the ATV tours “planning permission is essential”. Mr Zuill added: “We are happy that the Chief Justice agreed.” He said that the BNT supported sustainable growth of both eco and cultural tourism. Mr Zuill added: “If eco-tourism is to grow in Bermuda, it must be done in a way that does not harm the very environment it is seeking to promote to our visitors.” Colonel Burch said yesterday: “I have no comment on the matter at this time.” The Supreme Court heard earlier this month that Colonel Burch overruled officials from the Department of Parks and granted permission to operator Rudolph Hollis to run the ATV tours. Ben Adamson, the lawyer for BEST, said that officials had warned Colonel Burch the tours would breach the Bermuda National Parks Act and the Road Traffic (Western Section of the Railway Path) Order 1955. Charles Richardson, representing the minister, said BEST’s legal action was “highly premature” and that Colonel Burch could make a decision to grant a licence but not issue it until the needed legal changes were made. Colonel Burch announced in the House of Assembly last March that he had granted approval for a “licence to use vehicles on Government of Bermuda Property for a trial period of one year”. He said that the licence would allow for termination if conditions were not adhered to. Hundreds of objections to the plan were made by members of the public during a consultation period in 2017. 2019. February 6. A government minister rejected advice from civil servants to block all-terrain vehicle tours on the Railway Trail, a court heard. The Supreme Court heard yesterday in a civil case that Lieutenant-Colonel David Burch, the public works minister, overruled technical officers from the Department of Parks and licensed tour operator Rudolph Hollis to run ATV tours on sections of the Railway Trail in the West End. Ben Adamson, the lawyer for the plaintiff Bermuda Environmental Sustainability Taskforce, said that officials had warned that to allow the tours on the Railway Trail, Scaur Hill Fort Park and Hog Bay Park would breach several laws, including some designed to protect the natural environment. Mr Adamson added that the use of ATVs on the Railway Trail was “unlawful at the time of the decision, and they remain unlawful today”. He said that the officials had raised “palpable points” about “the safety, illegality, and environmental impact” of the plan. Mr Adamson added that Colonel Burch did not offer any reasons for why he disagreed with the advice. Permission for the tours was granted under the former One Bermuda Alliance government in 2017. Mr Adamson said that officials had warned Colonel Burch the tours would breach the Bermuda National Parks Act and the Road Traffic (Western Section of the Railway Path) Order 1955. Charles Richardson, representing the minister, said it was “absurd” to suggest that Colonel Burch had not considered the advice from officials, He explained: “I think it can be said as a bold headline that the reason why the licence hasn’t been granted, in fact, is because the minister wants to make sure that all the crooked roads are made straight so that no one is actually acting illegally.” Mr Richardson said BEST’s legal action was “highly premature”. Mr Richardson said: “No one has done anything illegal yet ... It’s a decision that hasn’t been acted on.” He added: “It’s almost like saying I’ve decided to go outside and cut the lawn and therefore my neighbour can get an injunction on me for noise, when I haven’t even started the lawnmower. Absurd.” Mr Richardson said that Colonel Burch could make a decision to grant a licence but withhold its issue until required legal changes were made. He added: “That’s exactly what’s happened here.” Mr Richardson said that it was not necessary for Colonel Burch “to list every single iota” that he had considered when he made the decision to grant approval. He added that if Colonel Burch had said he had “considered all the facts” and carried out “due diligence”, that was sufficient “unless my learned friends can show positively that he didn’t do that”. Mr Richardson added that concerns raised by officials were still under consideration. He insisted that the tours did not represent a major change of use of the Railway Trial. Colonel Burch announced in the House of Assembly last March that he had granted approval for a “licence to use vehicles on Government of Bermuda Property for a trial period of one year”. He said that the conditions of the licence would allow for termination if conditions were not adhered to. Mr Richardson emphasized that a permit to operate the tours had not been granted. Hundreds of objections to the plan were made by members of the public during a consultation period in 2017. Legislation to introduce the quad bike tours was approved by MPs last July. 2018. November 13. Scores of people walked and cycled to Gibbet Island yesterday to celebrate the opening of the new Railway Trail bridge. The trail is the result of work by the Friends of the Bermuda Railway Trail, numerous sponsors, workers and volunteers. Tucker Murphy, president of FBRT, said during a brief ceremony: “You can’t build bridges by yourself, it takes a huge team of people to do it. We hope that even more people will use the trail and use the bridges. I wanted to say thank you to all our workers and volunteers.” FBRT has sponsored and worked towards the reconnection of isolated sections of the Railway Trail. To mark the opening, supporters made their way to the bridge from other spots along the Railway Trail. The walk showcased some of the efforts undertaken through private investment. Mr Murphy’s father, Mike, chairman of FBRT, said the project would bring health benefits for locals and visitors and boost tourism. He said: “When I came here in 1972, it was all tourism. People weren’t as lazy or in as bad shape. The horrible thing that has happened with all the success here is they have gotten out of shape with modern diseases from not taking care of themselves. This is free and we are trying to get people out there.” He said he hoped people would take good care of the trail. “When you are walking be humble and bring a bag. Keep things clean.” Kevin Dallas, chief executive of the Bermuda Tourism Authority, said the project is making one of Bermuda’s natural assets more accessible. He said: “It is a fantastic example of what local involvement in our community can achieve.” Health minister Kim Wilson urged everyone to invite at least one person to join them on the trail to help combat what she described as Bermuda’s health crisis. Ms Wilson said: “As we all know, in Bermuda today chronic diseases are crippling our health and damaging our economic recovery.” Sedentary lifestyles contribute to this plague of obesity, with two thirds of adults overweight or obese. 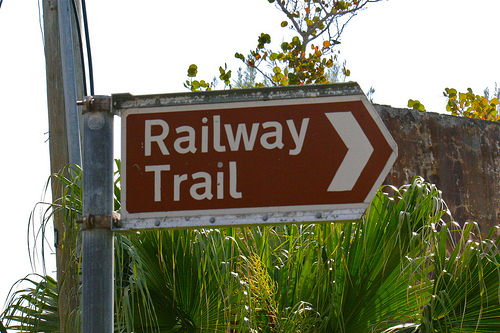 Open spaces such as the Railway Trail provide one of Bermuda’s most pristine public spaces for exercise and leisure. Thousands of people use them for our popular races; and for daily exercise as runners, dog walkers, cyclists and family leisure. We are grateful to the Friends of the Railway for their longstanding dedication to extend the railway trail connections. 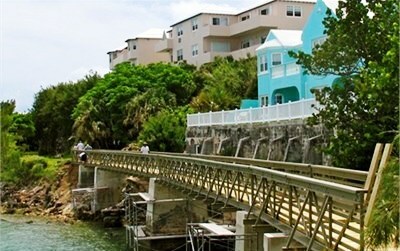 These new bridges, like the Bailey’s Bay trail bridges, are adding even more life to this beautiful Bermuda asset. It is a wonderful development. The idea that we will soon be able to walk or cycle from Coney Island to Palmetto Road almost uninterrupted is a truly exciting prospect.” The bridge was christened with rum because it was described as “the roof over North Shore Road”. Detours. All traffic traveling east on North Shore Road, when reaching the junction with Store Hill, will be directed over Store Hill on to Middle Road. All westerly traffic on North Shore Road, when reaching the junction with Middle Road, will be directed to Middle Road. Flatts Village access. Flatts Village access will be permitted in a westerly direction from the North Shore and Middle Road junction. Traffic traveling east may access Flatts Village from the junction of North Shore Road and Jennings Road. There will be no access from the junction of North Shore Road and Store Hill. Bus service. Bus service on North Shore Road from the Middle Road East entrance of Flatts Village, to the junction with Store Hill, will be terminated while these works take place. Bus commuters are asked not to use the closed section of North Shore Road during the scheduled times of the works. In case of bad weather, the road works will be rescheduled at a date to be determined. 2018. February 9. A footbridge over Flatts Inlet has won approval from planners. The project, championed by the Friends of the Bermuda Railway Trail, is one of three designed to link long-separated sections of the historic former rail track. The plan will include one bridge over the inlet, one over North Shore Road and a third over a private driveway. A planning assessment said: “The bridges will allow for further connecting of the historic Bermuda Railway Trail to be achieved, which will benefit members of the public and visitors alike. “It will enhance the existing experience for users of the trail and encourage further use while also allowing visitors another glimpse into the historic railway and beautiful vistas which would have been afforded to users of the railway at the time.” The FBRT earlier worked to install new bridges at Store Hill and Bailey’s Bay as well as providing a raft of upgrades to the trail across the island. The planning application said the bridge over Flatts Inlet would use the same pillars as the original railway, although additional piers will be added. The bridge would stretch 730ft and stand 22ft above the low-tide mark. The planning documents said the bridge would be high enough to allow tour boats and all but one of the boats moored in the inlet to pass underneath. The owner of the remaining boat said she would move the boat to another mooring before work started. A second bridge section would stretch 220ft, and pass 16.5ft above North Shore Road. The final section of bridge would cross 16ft over a nearby private driveway. All of the bridges will be designed to withstand hurricane conditions. 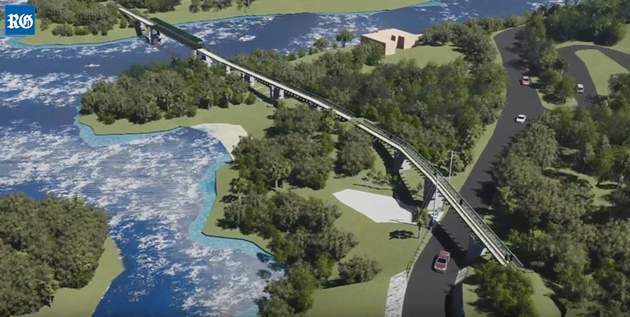 A public meeting about the proposal was held last May, and a computer-generated video was released online showing what the proposed bridge would look like. The proposal attracted four objections, including one from the Bermuda Environmental Sustainability Taskforce. The environmental charity said: “The proposal encompasses numerous conservation or protection areas and as such we believe that it’s essential that an environmental impact assessment be required to identify and avoid any as-yet unknown threats.” The three other objections came from residents who voiced concerns about the visual impact of the bridge over the inlet. The project also received a letter of support from another area resident. The planning assessment says that all of the objectors received letters of response and were notified when the final plans were submitted, but no further comments were received. UPDATE: this story has been amended to clarify that the bridge will pass 16.5ft over North Shore Road, not 12ft as originally reported. 2017. October 21. Plans to use quad bikes in Bermuda’s parks and on the Railway Trail need an impact assessment, environmental watchdogs said yesterday. 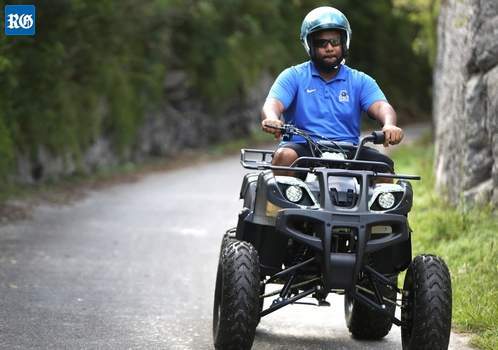 The Bermuda Environmental Sustainability Task Force warned that environmental, economic and social factors had to be examined to avoid “unintended consequences” of allowing commercial operators to use all- terrain vehicles in these areas. The call from the charity came after West End residents and environmentalists questioned plans, approved by former OBA environment minister Sylvan Richards, to introduce ATV tours to the Railway Trail in Somerset. BEST said the proposal “raises troublesome issues” and called for the scheme to be “thought through thoroughly”. The group added: “Consultation with the public and railway right of way defenders is a must so that we don’t find down the road that we have taken another step harming Bermudians, offending and turning off bread-and-butter tourists and furthering injury and death. BEST calls for an environmental, economic, and social impact assessment so that we are truly informed and know what we are doing, thus avoiding unintended consequences.” BEST’s chief advocacy officer Stuart Hayward added: “With so few open spaces available in Bermuda, all of which are desperately needed for the health and well-being of Bermudians, it is disturbing that this plan appears to have been approved without the appropriate assessments, public consultations and, we understand, against the recommendations of the Parks Commission.” The group added that the island had already experienced problems due to previous changes in transport policy. It said: “An example is the change in law about ten years ago allowing increased motorcycle size and power. Whatever the arguments for this — which might have seemed quite valid at the time — there have been and continue to be ‘unintended consequences’.” BEST said more powerful bikes had led to more frequent and serious accidents, made enforcement more difficult for police, and may have encouraged people already illegally racing bikes in Hog Bay Park. The group added: “Further, enabling this ATV plan will completely lose the original intention for including our railway trail in the parks system, preserving it as quiet, linear open space. Laws and regulations will need to be changed, paving the way for greater erosion of our parks as areas of safe, quiet, family friendly venues for walkers, joggers, children, dogs, horses, tourists and those simply wishing to enjoy time in nature.” Mr Richards said in an online statement last month that the idea was for “low-powered silenced ATV’s along part of the railway trail in Somerset only”. He added that tours would not operate on Sunday and parts of the trail would be off-limits to ATVs. The plan sparked opposition on social media and Greenrock’s director Jonathan Starling highlighted a lack of consultation. Neither the Ministry of Public Works nor the Ministry of Environment and Natural Resources replied to requests for comment yesterday. 2017. May 25. 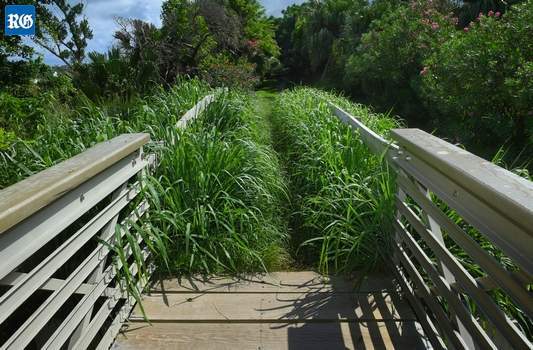 The Friends of the Bermuda Railway Trail have unveiled the latest stage of their project to reconnect the old trail and construct a bridge across the Flatts Inlet. 2017. May 13. Ambitious proposals to reconnect the Railway Trial by erecting a bridge across Flatts Inlet have been submitted to planners. The Friends of the Bermuda Railway Trail project has already seen new bridges installed at Store Hill and Bailey’s Bay as well as a raft of upgrades to the trail across the island. Under the plans a bridge will also be built over North Shore Road close to Gibbet Island in Smith’s that will join up with the trail before continuing across the inlet. “A total distance of approximately 800ft will be bridged,” the application states. “The bridged sections of the trail will be a minimum of 6ft wide — following well-established standards for “rails-to-trails” initiatives and pedestrian bridge specifications elsewhere. This width will increase to approximately 8ft for the main span crossing Flatts Inlet.” The plans state that the bridge and the approach will be set at 22ft 6 ins; providing 20ft of clearance through Flatts Inlet at high water, similar to Watford Bridge. 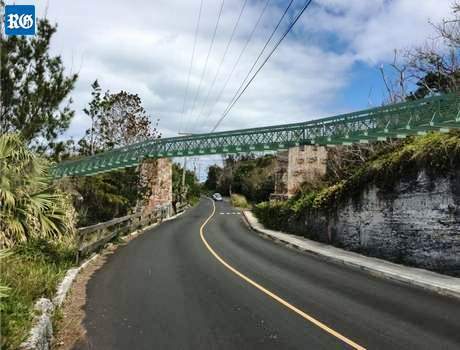 The bridge over North Shore Road will provide a minimum of 16ft 6 ins of clearance for vehicles travelling along the road in accordance with recommendations from the Highways Section of Public Works. “The bridges will be constructed according to standard specifications and employ solid stainless steel fixings, mounting brackets and safety rails,” the application states. “Bridges will be designed to meet category 3 to 4 hurricane criteria, and are the same or similar to the models used at Bailey’s Bay and Winton Hill, which have been tested by four recent hurricanes in Bermuda without incurring structural damage from the wind or the water.” The application outlines a series of health, tourism and transport advantages of the overall project. “The project would create an almost continuous off-road route on the eastern end of the island, 8km in length. apart from a 490m break near Crawl. “It would expand the area of accessible trail and park area for residents of both Hamilton Parish and Smith’s in particular providing safer pedestrian and bicycle access for residents of the North Shore looking to access the parkland and beach area at Shelly Bay. “The proposed bridge link would also create a better, off-road connection between the east end of the island and the widest and least trafficked road into the City of Hamilton — Palmetto Road. Reconnection of the trail across Flatts Inlet has particular potential as the trail in this area has magnificent views down the North Shore towards Dockyard and looking back towards Flatts Village.” The Friends of the Bermuda Railway in conjunction with the Ministry of the Environment will hold a public meeting on May 18 to provide further information about the project and the latest plans. The planning documents should be available to the public at the Department of Planning shortly after Thursday’s meeting. The meeting will be held at 12.30pm at the Chubb Building Chairman’s Suites, although parking will not be available in the building’s car park, and will include a short movie by volunteer Peter Carfoot of Linberg and Simmons that provides a virtual walk over the simulated proposed bridges. Section East 3B: Crawl Waterfront Park to Bailey’s Bay Bridge, Hamilton Parish. refine as a year-round adventure for visitors and locals. Explaining the new nickname, BTA director of public and stakeholder relations Glenn Jones said: “A snappier name built for a hashtag instead of a museum is one way we hope to modernize the asset. “It’s not an official name change; we don’t have the authority to do anything like that. But just like we all sometimes use Bermy in place of Bermuda because it’s more youthful, we hope Rail Trail has a similar impact.” #RailTrailBDA will be used as part of the BTA’s 2017 plan which calls for one event in March in the East End, and a second in November in the West End, a “strategic approach to use both ends of the shoulder season”. Mrs Phillip-Fairn said: “The Rail Trail can definitely play a role in our refined position as a truly year-round destination. Residents are already using the Rail Trail more because of recent improvements and better connectivity so at the BTA we want to take that momentum and inspire even more enhancements and more links. We can do this working with Friends of the Railway Trail, our partners in government and a lively group of entrepreneurs who continue to bring fresh business ideas to the trail and to tourism in general.” The BTA kicks off its Rail Trail plan with an event Sunday, March 5, along the Hamilton Parish stretch of the Rail Trail between Shelly Bay and Bailey’s Bay. Health and wellness experiences like paddleboards, yoga and soca-size will be on offer for free at the Shelly Bay end while Gombeys, rum swizzle and island music will dominate at Bailey’s Bay Cricket Club. There will be healthy or culturally relevant food available at each end of the journey. Along the way, the BTA will plan surprises to excite participants and challenge them to experience the Rail Trail in a new way. Visitors and locals are welcome. Mr Jones said: “Our ‘surprise and delight’ activations are where we want to inspire entrepreneurs. Ultimately, we hope they see the Rail Trail as a tourism opportunity ready for services that enhance the experience of those who use it. As we successfully increase usage of the Rail Trail we increase job opportunities for Bermudians.” The BTA added thanks to a collection of partners and entrepreneurs who have enthusiastically jumped on board to help the country rediscover the Rail Trail. 2015. December 22. His trademark “I love you” greetings for commuters have made him famous all over the world — but now Johnny Barnes is considering waving goodbye. Mr Barnes, who has not been his usual early-morning permanent presence at the entrance to the city for the past few weeks, told The Royal Gazette that he was considering “retirement” at the age of 92. He said he had been having problems with his legs recently, and although he hoped to continue his daily ritual at the roundabout at the bottom of Trimingham Hill, he was not sure he could do so. “When you get to 92 you have to slow down a little bit,” he said. “When you have an old bike you can put oil on the wheels to make them go, but I can’t put oil on these knees. I have been at home resting and relaxing for the last couple of weeks and I’m just not sure at the moment whether I can carry on what I have been doing for so long. I am thinking of retirement, but have not made a final decision yet.” Mr Barnes has greeted the Island every weekday morning for more than 50 years. He started waving at passers-by while he was working as an electrician on the Bermuda Railway. He made it a daily tradition when he was just 23. Sound the train once made (right). train.WAV. 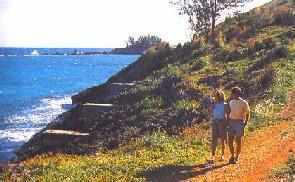 The Bermuda Railway Trail ("the Trail) is owned by the Bermuda Government. There is a free illustrated walking guide, issued by the Bermuda Government and available only from the Visitors Service Bureau of the Bermuda Chamber of Commerce in the City of Hamilton or Town of St. George. Visitors should go in person to get a copy as it is not available online by PDF from any Bermuda Government website. Also, read the two definitive histories of the line from the early 1930s to its ending in 1949. In 2000, the Bermuda Government's Parks Department - at 169 South Road, Paget DV 04, P. O. Box HM 120, Hamilton HM AX, Bermuda - a division of the Ministry of the Environment - took over administration and management, to enhance it as an eco-tourism attraction. All visitors should phone the Parks Department at (441) 236-4201 or fax 236-2711 for all enquiries relating to the Trail. In 2001, the entire Trail was designated a Class B Protected Area under the Bermuda National Parks Act 1986. There are no parking spaces anywhere along it specifically for bicycles to be locked and left. See farms, fields, pastoral tranquility and shining, turquoise open water, depending on where you are. In many areas, the open Trail has trees, plants and flowers hugging the original track area. 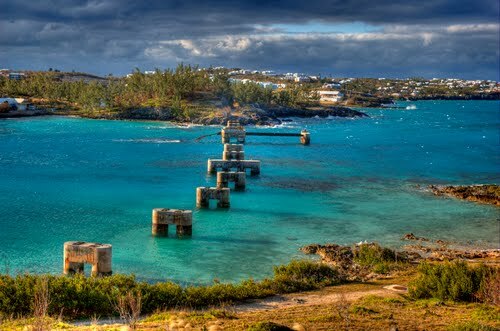 It is one of the very best ways to appreciate the coastal and inland beauty of Bermuda on foot or by rented pedal cycle. Bring a digital or compact camera to explore and record this unique and tranquil place for a journey back in time. 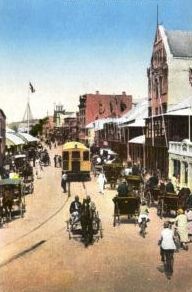 It was when Bermuda was without any motor transportation (instead of the 2,506 motor vehicles per square mile on the roads now, one of the highest in traffic density anywhere). A major revamp of the Trail in some places has been accomplished, for example, the stretch from Shelly Bay Beach west to Flatt's. At some point in the future, it is intended that private sector parkland will be linked to the Trail. 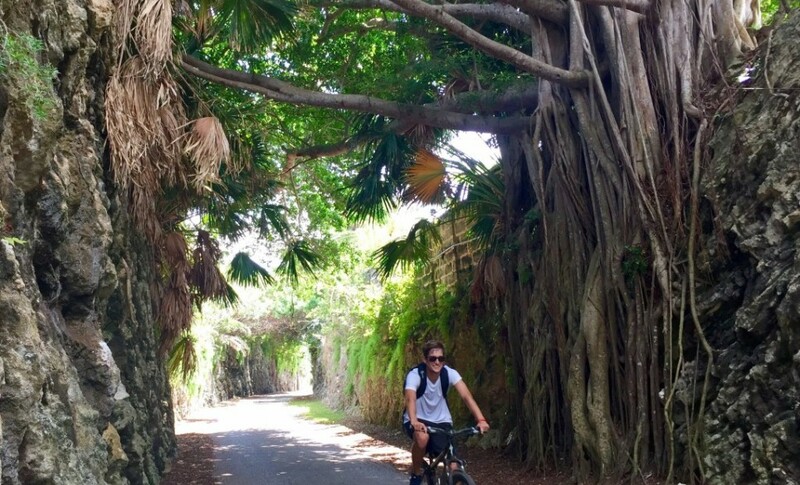 Features include a generally motor vehicle-traffic-free (except for a very limited section in the Sandy's Parish area where the Railway Trail is paved and mopeds/scooters may be allowed) bikeway and walkway, very rare in Bermuda with over 3,400 residents per square mile. This railway Trail is not uninterrupted. It no longer exists anywhere in and today is some distance (not suitable for walking or running or cycling) from, on very busy and narrow roads, the The City of Hamilton in the centre of the island or Town of St. George (St. George's) in the east where the railway once served until 1948. 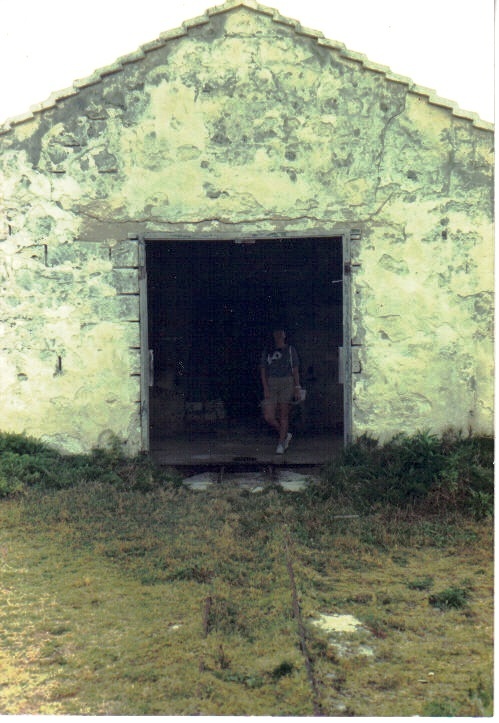 It never served the old Royal Navy Dockyard (Dockyard) on Ireland Island in Sandys Parish where most cruise ships visiting Bermuda now berth at Heritage Wharf or King's Wharf. 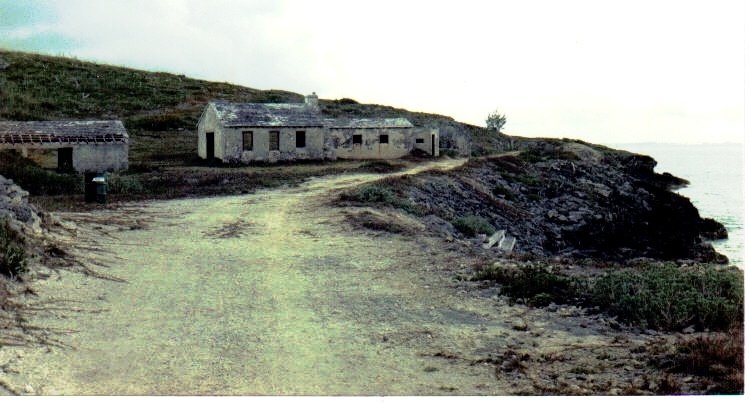 On the western side of Bermuda, the Dockyard is also several miles from the trail. It is some distance from all three places. Nor is there direct public transportation access to the trail from any of these places. This presents a challenge to the visitor, in particular those who arrive by cruise ship. Access to the trail from the city or the town is several miles away. From both the city and the town there are no public transportation services to or traveling on the trail (public transportation services are on main roads only. 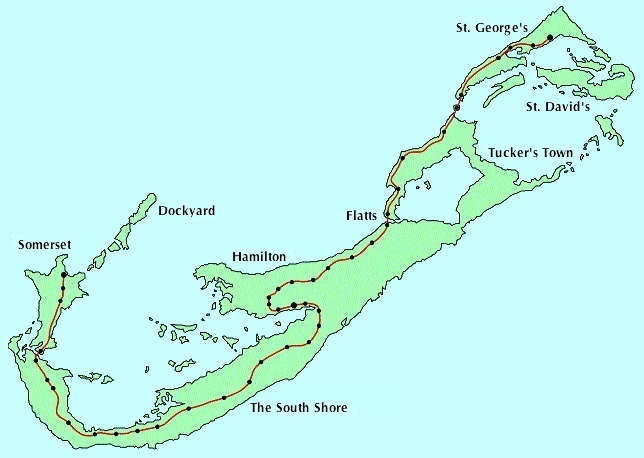 The primary original purpose of the original Bermuda Railway was to make Bermuda train-accessible from Somerset in Sandys Parish in the west to the Town of St. George in the east, with the City of Hamilton, the main terminal, about half way in between, about 11 miles between each of these three places. It was not intended as a scenic tourist railway but to operate as a reliable train service for commuters traveling to the City from the more populated areas of the west (Sandys, Somerset, Southampton, Warwick) and east (Devonshire, Smith's, Hamilton Parish, St George's). It does not go at all to certain other picturesque but less populated places. Thus, it is mostly inland from the west going east and mostly coastal from the City going east. In quite a few places it is interrupted by main and usually busy roads, some with no sidewalks or sidewalks on one side only. It follows most of the former rail track, with newer signs added in 2008 and sometimes stops abruptly. It is uneven in places, has steps, and only able walkers can more safely or nimbly negotiate streets or roads crossing or running from the trail, often without sidewalks. For those who want to rent push bikes/pedal bikes it means care must be taken to rent from bike livery places that will cater to the needs of the visitor in getting them to and from the trail. Parts of the trail are paved, but the great majority is unpaved. Railway Trail route, when it began, shown in dotted red line. Those who walk or cycle or run on the Trail today should note it is not near the Dockyard, is no longer continuous, is now interrupted or no longer exists in several places, no longer goes into or out of and today is several miles from, Hamilton or St. George's. But to make up for these challenges, there are gorgeous marine views in many places. The Trail is wonderful for a cyclist or the able walker or runner and the slower walker with no mobility problems. It is not good for those with mobility problems who need a walker (zimmer) or crutches. It is not suitable for the accompanied or unaccompanied in a wheelchair, or an electric scooters for the disabled. In the humidity, heat and risk of sunburn from May to October, it is not recommended that you cycle, run or walk the Trail unless you are well-used to such strenuous hot and humid conditions and carry plenty of bottled water. Note that no part of The Trail has a water station or stores of any kind, or bathrooms (toilets, WCs). The Trail is ideal for a tranquil walk on a part of it but is not a good place, because of its isolation away from places or people available to help in times of distress, for irregular, strong physical exertion. If you rent a cycle anyway, you will need to cycle back to where you rented it if a rental service will not come to collect you. Ask where you are staying to have this confirmed in advance of your arrival. 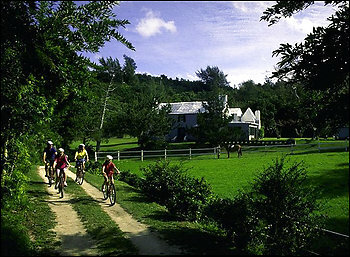 Cruise ship and other visitors should also note carefully that when most Bermudians and residents cycle on the trail with their own cycles, they favor a one-way route (with a friend or relative picking them up) and will generally wait for winter to do this, to avoid the combination of heat and humidity especially in the summer months but also often in spring or summer or fall. Cruise ship and other visitors should be aware that robberies sometimes occur on the trail and should take sensible precautions like not walking alone and not taking valuables such as handbags or wallets or credit cards or much cash. Instead, take spare wallets without valuables. In 2015, on June 11, police reported how a visiting couple were robbed of a pink handbag yesterday afternoon by a man wielding a hammer on the Railway Trail in Sandys. As early as 1910, a Canadian corporation attempted to bring regularly scheduled, motorized public transportation to Bermuda and went so far as to form the Bermuda Trolley Company Limited. Unfortunately, nothing came from it as there was a bitter altercation between some of its principals and various people in Bermuda. Bermudians wanted a quick return on their investments. They regarded the project as too risky, especially following later sabotage incidents - and too expensive. They refused to invest (but became managers, train drivers, conductors and users). 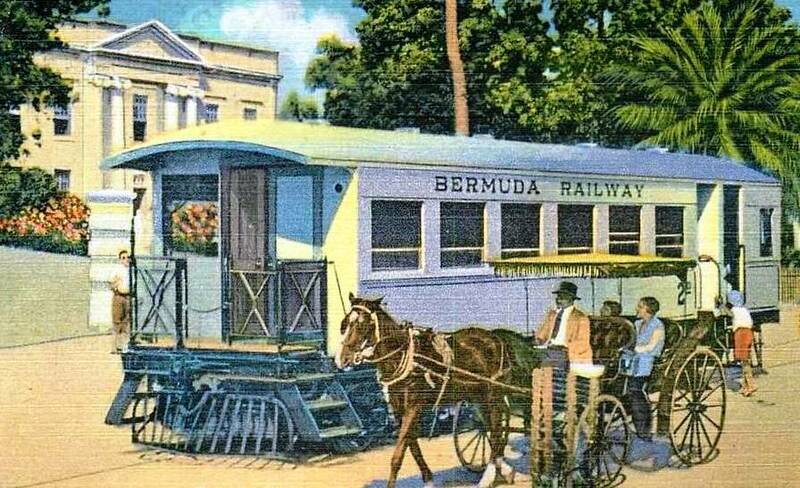 Had the Canadian owned Bermuda Trolley Company not been interfered with, it would have had a positive effect - would have brought public motorized transportation to Bermuda far earlier than when train services finally began in the 1930s. The feud reached its climax in 1924 when an entirely separate entity, the Bermuda Railway Company, was formed. 1924. 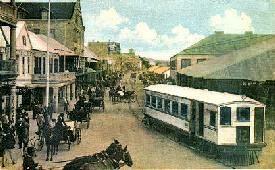 (See aftermath of Bermuda Trolley Company Ltd of 1910). 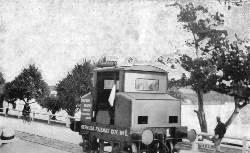 The British-backed Bermuda Railway Company, was formed. It was incorporated by Act of Parliament and announced its intention was to survey for and construct a modern transportation system for what was then a no-automobile island. 1924. A Mr. Cummings arrived in Bermuda from the UK, surveyed the land, and announced that a railway from one end of the island to another, from west to east, was the perfect solution to the island’s transport problems. It was then deemed by many Bermudians and residents as the ideal way to claim to the rest of the world that Bermuda, unlike so many other places on the world's business and tourism map, did not need or want motorcars in the islands and could harness a far more practical alternative. As his reward, Mr. Cummings was granted a handsome retainer as chief engineer of the as-yet still un-built railway, to continue until the whole track was laid - an event with did not commence to be laid until seven years later. At his suggestion, the railway's route was deliberately planned as a mostly coastal route, even if it meant building costly trestle bridges over inlets and bays. There was a strategic underlying reason for this mostly coastal route, to help ensure that the costs of compulsory land acquisition of private property, a process which had begun in the UK far earlier, then in Bermuda in the acquisition of large tracts of land for British military defence purposes in Devonshire Parish in the mid 19th century, then from 1920 to 1923 in Tucker's Town, would be only for the land side of the route in the coastal areas. Nevertheless, this aspect of railway building alone was a massive public undertaking. Numerous real estate transactions were to ensue, in what became by far Bermuda's largest, most contentious and most expensive to the company land acquisition program in Bermuda's history, this time not in parcels of land in one Parish only but wholesale, in every Parish in Bermuda from one end to the other. By the standards prevailing at that time owners of expropriated land and dwellings, who had no choice in the matter, were compensated fairly. It became the single biggest-by-far expense for the company, the main reason why it cost ten times more to build the Bermuda Railway in its 23-mile journey than any other railway before or since. All sorts of delays pushed back its completion date. It was an uphill battle, with many approaches to buy land bitterly contested, so much so there was a delicate and expensive business of appropriating—at a price—the necessary property for the tracks. A local jury was appointed to adjust any questions of valuation, which they did to such good purpose for landowners that the company usually preferred to pay the prices asked by landowners rather than send the case up for adjudication. It took from 1924 to 1931 to get what eventually became all eight Acts of Parliament through the local legislature and give the Bermuda Railway Company the authority it needed to buy the land on which to run the railway and start its operations. What was never questioned was the remarkable, quality way the track was laid, over bridges, many areas that had to be made level, deeply indented landscapes and much more. But once completed, the trains ran smoothly. It was an expensive and long-drawn out triumph, for when the engineers were not painfully achieving deep cuttings they were raising lofty trestles, to defeat Bermuda’s ups and downs, or throwing bridges and yet more bridges over the many indentations of the jagged coastline. J. Reginald Conyers was the Vice President of the company. As one of Bermuda's few barristers (lawyers) at the time, he was ultimately responsible for the huge amount of legal conveyancing of property to the company from its original owners. A Member of Parliament in 1928, he was too busy to take on conveyancing load by himself. Thus he recruited Bayard Dill and James Pearman, also lawyers. From that developed the Conyers, Dill & Pearman legal practice still doing business today. 1931. Early. British private investors finally funded its latter construction that led to its completion. 1931. The Bermuda Railway company ordered eight 20-ton 120hp petrol-engine-powered bogie coaches, plus six 14-ton bogie first class coaches and two 14-ton bogie freight vans from Drewry Car Co Ltd in the UK. 1931. Arrival of the train from Britain. Very grand new rolling-stock had been ordered from England. Unusually for that time it was not steam but gasoline (petrol) powered. A cutting from the UK's Daily Herald of 1931 mentions a new type of “rail automobile” being made in Preston, intended for the projected Bermuda railway. These smokeless petrol-driven passenger coaches modern indeed, before the introduction of Diesels. The first Pullman coaches were painted a delicate primrose yellow with white tops. Excitement at the arrival of the coaches aboard S.S. Bermudian ran high, and a huge crowd gathered along the Hamilton docks to watch their precarious unloading. The boat had had a rough crossing and while struggling through a hurricane one unit tore adrift from its moorings and careened about the decks among the other rolling stock, damaging itself and the rest. Repairs had to be done locally. The railway train, engine, other rolling stock such as carriages and track were all built in England by the Drewry Car Company - see http://en.wikipedia.org/wiki/Drewry_Car_Co - which, despite its name, dealt mostly in railway (railroad) matters. The individual most responsible for the successful final establishment of the railway was Harold Jennings Kitchen, a former Drewry design engineer and middle-manager (who stayed until the final end of the Bermuda railway, after which he was appointed by the Bermuda Government to run the public bus company, as the Director of Public Transportation until his death in 1950). 1931. Afternoon of Tuesday, 13th October. The first full successful trial run was made from Hamilton to Somerset (as the line to St. George's had not yet been completed). 1931. October 31. 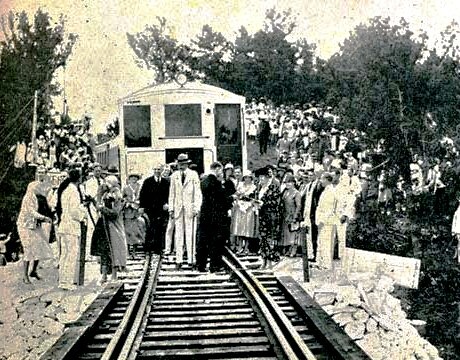 The official opening of the Bermuda Railway, then Bermuda's only type of public transport for locals and visitors, but privately owned. The official party assembled at # 1 Shed in the City of Hamilton where they were welcomed by a reception committee. Governor Cubitt and Lady Cubitt were greeted by Mr. and Mrs. O. A. Jones, for the construction engineers. It was a special moment that day when Miss Rosemary Grissell, step-daughter of the then Governor, Sir Thomas Astley Cubitt and Lady Cubitt started the first train from Hamilton to Somerset. (Another special feature of this grand opening ceremony was the ceremonial cutting, by the Governor, of the ribbon across the new bridge at Somerset, this finally uniting the two islands). Others present included H. W. Watlington, who had guided most of the railway legislation through Parliament; Mr. Stemp, Managing Director and traffic coordinator of the Bermuda Railway Company; and J. R. Conyers, Vice President. Then came Major R. W. Appleby, Attorney General of Bermuda at the time and one of the Railway Commissioners. (Later, he became a founding partner of Appleby Spurling and Kempe, later Appleby Global, one of the two great local legal partnerships). After speeches, the group boarded the train for Somerset Bridge, driven by W. G. Amos. At Somerset Bridge, more speeches were made. After a buffet reception, the group and driver re-boarded the train. One carriage had to be left behind at Riddell's Bay, after air brake problems were experienced. 1931. November 1. Regular passenger service began, on the route map shown below. It was also the day the railway claimed its first casualty. Immediately after his first ride, George Watts Hill Kemp, accompanied by his wife, was able to alight without mishap at a regular stop but in the darkness lost his footing. He fell over an embankment, was severely injured and died soon afterwards. On a happier note, the train tunnel under Bermudiana Road was blasted through to Pitts Bay Road less than two weeks later. Almost as soon as the trains started running, spasmodic sabotage complicated matters. It was only by sheer luck and clever judgment of the officials that several nasty accidents were avoided. Fires were mysteriously started along the sheds, obstructions were placed along the tracks. It is thought that some of the damage was engineered by carriage-drivers and owners who saw in the new venture a serious danger to their own livelihood. 1932. January. Additional vehicles were ordered for the railway. 1932. February. When fully completed in that month, the line ran from Sandys Parish in the west to St. George's Parish in the east, via the City of Hamilton. 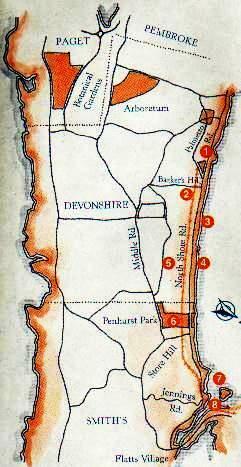 (Today, the City, Pembroke and parts of the Devonshire portions no longer exist). Today, the Railway Trail does not pass through any villages or towns. The new form of transport caused other major problems. Bermuda was not yet railway-minded. Nor was her livestock. Horses reared and bolted, cows, and goats tethered within sight or sound of the engine ran away and went amok, refused to give milk, and otherwise expressed their disapproval. People living anywhere near the railway complained long and loud about the noise of wheels and whistles. Children rushed from all directions at first sound of any train, and endangered their own lives and the nerves of locomotive drivers by dancing across the lines, crowding too near the carriages, and generally making nuisances of themselves. The local Press published columns of indignant protests and complaints, alongside with passionate vindications from those of the opposite camp. One way and another, the new railway was news. Plus, difficulties natural to Bermuda’s peculiar position and status developed. Ticket-collectors had to cope with mathematical problems in three different currencies—the native pound sterling, American dollars and Canadian dollars. Working out fares from one little station to another meant further headaches, to say nothing of the great issue of Statutory and non Statutory trains. This was an inevitable complication but none the less tiresome for passengers and officials alike. According to its charter, the Bermuda Railway had to justify itself by a steady schedule of so many trains a day. Fares on these trains varied greatly depending on which were Statutory and non-Statutory. This took a lot of explaining to disgruntled tourists who not unnaturally, frequently questioned the demand for a much higher fare on an identical train running on an identical route at different times. Once Bermudians and visitors accepted or were resigned to the system, it gradually earned affection from many. The major reason was its warm reception by tourists entranced by the fun of rides in such a toy, and the unique beauties revealed along its scenically designed track. The train ran past scenic landscapes and seascapes, via bridges and trestles connecting coves and inlets, many built by Canadian Indians. (But they suffered from constant corrosion and many no longer exist). Many viewpoints were seen for the very first time from the comfort and height of a railway-carriage window. Many Bermudians and residents were taken-aback by what needed to be done to get rid of rubbish seen from the route. That was dealt with, in short order. The Railway Commissioners were appointed by the Bermuda Government to independently oversee the operations of the railway. 1939. September. Then came the outbreak of World War 2 in Europe. Bermuda was well away from any land war but the war at sea exacted a grim toll on the railway. Tourism ceased immediately. Imperial Censorship, British Army and Canadian Army, Royal Navy and Royal Canadian Navy units based here created a new order. From 1941 large portions of Bermuda were long-term-leased US Forces based in Bermuda. They began to use American taxpayers' dollars by the millions, beavering away, assisted by thousands of hard-hatted, hard-drinking, hard-muscled civilian workers, to remove, alter and add to islands to create military bases from scratch. This sudden increase of population reacted immediately upon the railway. Up till then the normal average of passengers a year was about 700,000. In 1942 this jumped, almost overnight, to 1,425,000 and by 1944 exceeded 1,500,000. This was when any thought of obtaining additional rolling stock from England - or anywhere else - was out of the question. The terrific extra load had to be carried by stock already worn in service, and with shortage both of the labor and of spare parts. When the first U.S. troop ships arrived, it was the little railway that transported guns and men to their bases at the new US Naval Operating Base in Southampton and Fort Bell and the US Army and its USAAF at Kindley Field in St. David's. In all, more than 4,000 troops and their equipment were handled, in that operation alone. It was the railway that had the problem of transporting base-workers living throughout the islands to and fro from their urgent jobs, morning and evening. It took time before essential heavy motor transport for the bases could arrive and be put to use, on roads that had to be reinforced to take them. 1941. Thanks solely to the American military already here, the USA helped enormously to get the railway some relief. General Strong got an AA1 priority for new equipment, including the first Diesel locomotives. 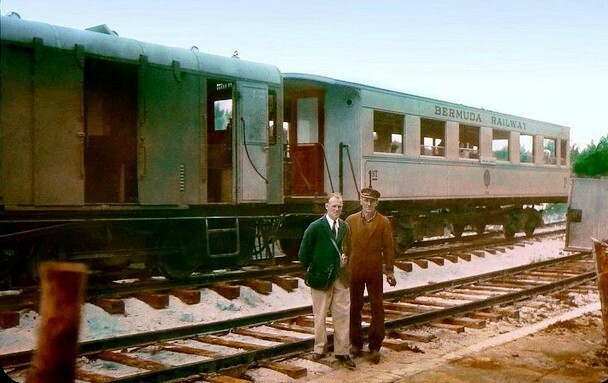 Two ex-US Army Brill railcars were also added to the fleet, specifically to assist the American forces then based in Bermuda during the Second World War. One very hush-hush job was the transport in the dead of night by the railway and its new locomotives and Army railcars of heavy guns for the fortification of the South shore. Automobiles on reinforced roads had to be permitted for the American, British and Canadian military. British and American soldiers stationed in Bermuda and their Bermudian counterparts added so significantly to the railway's use with their constant movements that huge damage was caused to bridges, sleepers, track and trestles. By 1945. The Bermuda Railway became too impractical and expensive. It was unable to meet the costs of repairing its rolling stock. 1946. The Bermuda Government purchased the railway company at the distressed price of £115,000 pounds sterling (then the island's official currency), primarily to ensure it alone had control over Bermuda's transport system. 1946. The national bus system was first introduced, to replace the railway and offer a more comprehensive choice of routes. 1947. Three successive Acts of Parliament finally officially closed what little was left of the Bermuda Railway. 1947. December 31. At midnight a small pike of the Hamilton to Somerset part of the track was ceremoniously removed and demolition began the next working day after the New Year Holiday. The last train had gone from Hamilton along the 22 railway bridges between Somerset and St. George's. It was open for 17 years and carried an estimated 14 million passengers. Its remaining assets were sold at bankruptcy prices by the Bermuda Government to what was then the British colony of British Guiana (now independent Guyana) in South America and shipped there. (As far as we know, parts of the old Bermuda system still run there, inland). It may be long gone, but is not forgotten. It was a world record-breaker in several ways - as the shortest time in history (seventeen years) of any railway system; the highest cost per mile of any railway system before or after; with more bridges than any other (one tenth of it's entire track); the largest number of sea-crossings (nine) before or after per entire length of track; the most controversial politically and economically in its history. Never before had any railway cost so much to be completed - over £1 million pounds sterling, for the train to travel three million train miles in its history, estimated with over 14 million passengers - yet resulted in such a paltry sum when sold. 1948. It was only then that civilian Bermudians and local residents were allowed to import and own motor cars. Locals and visitors could go anywhere at any time instead of being bound by the railway and bus timetables. For years, the track was allowed to deteriorate. The cost of converting the old Bermuda Railway system into a road for motor traffic was deemed to be too high. 1949. Bermuda lost forever and said goodbye to the one-track Bermuda railway, the most expensive train ever built. It began in the early 1930s and once brought trains right up to the pier for bigger ships. 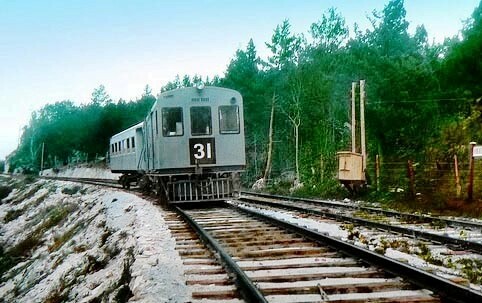 The train carried millions of tourists in its eighteen years. It was sold to Guyana, then still British Guiana, in 1948 and shipped in 1949. The shipment included two freight railcars along with all the rolling stock and most of the rails. (They were used in Guyana for nearly 25 years until the country’s passenger service ended in 1972, but some carriages were saved and used for storage). 1980s. 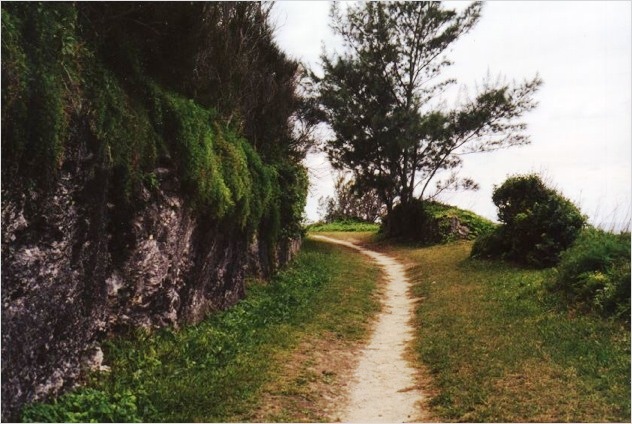 Finally, the Bermuda Government converted the abandoned tracks into a walking and biking trail running almost the entire length of Bermuda. Much of it is well away from the continuous noise of traffic on the main roads and a delightful way to see lovely parts of Bermuda that may otherwise be missed. They offer beautiful sightseeing. See route of this journey of train, namely City of Hamilton; Pembroke; Devonshire; Smith's; Hamilton Parish; St. George's Parish; Town of St. George. See route of this journey of train, namely City of Hamilton; Paget; Warwick; Southampton; Sandys. Nearly 2 miles long, it stretches east from the Somerset Bus Terminal (original Railway terminal) to Somerset Bridge where Section 2 begins. On October 31, 1931, in Somerset, Governor of Bermuda, Lieutenant General Sir Thomas Astley Cubbitt, formerly opened the western branch - in sections 1 and 2 - of the Bermuda Railway. Starts between the bridge and Overplus Lane on the water side. Pass Springfield and the Gilbert Nature Reserve, then Harmon's Bay, the Heydon Trust Estate, Scaur Hill fort, Skroggins Bay and former Lantana Colony Club, to Somerset Bridge. Overplus Lane was omitted by mistake when the original survey was made in the 1600's. From the water side of Southampton Parish, see what used to be the US Naval Annex. The greater part is in Southampton Parish. Going east, access it via Overplus Lane. Pass Evans Pond, with native flora including Bermuda cedars. You might see herons. At the junction with Whale Bay Road, there's the former Railway station, now a Sunday School. Diverting along Whale Bay Road for more gorgeous scenery to Whale Bay Park and Beach. Going east back on the Trail, to the left of the main Middle Road, look over Evans Bay and Franks Bay. There, cross the Middle Road and rejoin the Trail for Section 3. From here on, get superb views of the Great Sound and Black Bay. Continue east, via the Tribe Road # 2 junction. See Gibbs Hill Lighthouse. Observe Jews Bay. Note the Southampton Princess Hotel. Below it, on the Great Sound, are the hotel's Waterlot Inn restaurant and Princess Park. Proceed to Riddle's Bay and the Warwick Parish boundary. Take a right on Tribe Road # 7, and go right to the end for the scenery of the South Shore, especially the Beach Parklands area. Parts of Sections 3 and 4 are in Warwick Parish. They start right on the Parish boundary line. Take Middle Road as far as the turn-off to Camp Hill Road at the Heron Bay Plaza (just over the Southampton Parish boundary line). Then turn on Camp Hill Road, then turn left again (going east) at the Bermuda Railroad Trail marker. Note the old Riddell's Bay station. Keep going, to the intersection with Tribe Road # 7. Divert to the right on this road, because it leads to South Shore Park. Stay on the Trail to pass between Warwick Secondary School and Warwick Ridge Park. If trees interest you, look carefully at the variety in the woodland area. Bermuda allspice predominates. Further east, avoid an accidental right turn onto Lusher Hill West. Instead, bear slightly left and you'll walk along the southern perimeter of the Pembroke Hamilton Club (PHC) Stadium where cricket and soccer matches are played. Then walk under the huge old quarry, Khyber Pass. It was named in honor of the exploits in Bermuda from 1851 to 1853 of the Second Battalion, 56th Regiment (West Essex) of the British Army. Its First Battalion was virtually annihilated in 1841 at Khyber Pass in Afghanistan after a disastrous retreat from Kabul. The lone survivor was the surgeon, Doctor Brydon, half dead when he reached Jallabalad with the news. So when the recomposed regiment reached Bermuda, its first overseas posting afterwards, its military reputation ensured that areas of Warwick Parish - Khyber Pass, Khyber Heights Lane, Khyber Heights Road and Khyber Pass Road - and a street in the old town of St. George, near Fort George - got named after Khyber Pass. The Second Battalion also fared badly in Bermuda. In 1853, nearly 230 of its officers and men died in Bermuda from Yellow Fever. A little further, see Warwick Pond on your left, followed by the intersection of Tribe Road No. 3, the end of Section 3. The Paget Parish portion goes past prime agricultural areas. It will take you on both the Trail and Ord Road - named after a former Governor. Walk along the southern perimeter of the Belmont Golf Course. From here, bear to the left, where the Trail continues and discards Ord Road. Pass behind Bright Temple AME Church. A little further ahead, you'll see Cobb's Hill Gospel Chapel and Cobb's Hill Road intersection, the eastern boundary of Warwick Parish. A left on Cobb's Hill Road will take you to the intersection with Middle Road, where you can catch the # 8 bus east or west. Two of our favorite places on the Trail are the Paget Parish areas immediately to their east. Take a walk to the old Harmony Hall Hotel/Club (now Police accommodation) in less than one hour - and then from here, to the South Road via an intriguing old tunnel. When Paget Parish's exclusive Trimingham Hill area was created and much of Pembroke Parish - from near the City of Hamilton on the south to the North Shore - was re-developed, the Trail lost much ground. There is nothing left at all of the original Trail through east Paget and Pembroke Parishes. Mostly in Devonshire Parish, it begins a hundred yards up Palmetto Road from the junction with the main North Shore Road. See the access sign just east of the Public Transportation Headquarters Building, on the eastern end of Palmetto Park. This section heads east to Smith's Parish. Cross over the bridge at Barker's Hill, with the Ocean View Golf Course to the south. Pass by Palmetto House. Enjoy the North Shore coastal, domestic homes and rural views. At the Smith's Parish boundary, enter Penhurst Park. The Smith's Parish portion is only just over a mile long. Going east, there are gorgeous seascapes, from hilly vantage points. The turquoise waters of the North Shore coastline are exquisite. The Trail bisects Penhurst Park, with its southern extremity bordering the Middle Road and its northern extremity actually across the North Shore Road and right on the coastline. Further east, you'll cross a bridge going over Store Hill, a road that runs between and connects the Middle Road with the North Shore Road. (Improvements to this area, with restoration of the bridge and railway supports, occurred in 2015. 2015. November 28. The latest stretch of the Railway Trail to be restored under ambitious plans to reconnect the track was officially opened this weekend. A new bridge was erected where the trail crossed Store Hill and a large section of the nearby Smith’s track has been cleared. Michael Dunkley, the Premier, joined Governor George Fergusson at the official opening of the bridge at 10.30am. The opening brought to an end more than 11 months of planning and construction work on the Smith’s section of the trail. The latest phase involved four of the original old concrete pylons being raised and restored, while a brand new fifth pylon was constructed to take the weight of the bridge sections. Mike Murphy, together with his son, Tucker, were at the forefront of the scheme. He said:” On behalf of Friends of the Bermuda Railway I would especially like to thank our founding members Jay Nichols, Limbo Up Foundation and the insurers and reinsurers, Allied World Assurance, Ironshore Insurance Ltd., Renaissance Re., and the recently merged Montpelier Re. We appreciate them for having the foresight and vision as well as providing core financial backing to continue to connect the trail so that it becomes a safe and healthful place for Bermudians and tourists to exercise and enjoy the scenery along the way.” (In the 1950s, using a cycle from here to get to the city of Hamilton and back was very popular and it could be so again. At this point, you'll see private dwelling houses to your left and right, in different styles and colors. The Hamilton Parish portion is especially interesting. It starts at the other side of Flatts Inlet, about three hundred yards northeast of the Bermuda Aquarium, Natural History Museum and Zoo. Enjoy a nice view of the Inlet and see the remains of the old bridge pylons where the railway once crossed over. On the North Shore Road - and Bermuda Railroad Trail - half a mile east of the Bermuda Aquarium, Natural History Museum and Zoo in Hamilton Parish, was once the small, privately owned Bermuda Railway Museum museum. When opened (now closed) it occupied a former Bermuda Railroad station. Bus routes 10 and 11 will get you to the nearby stop. Owner Ms. Rosa Hollis had a nice collection of maps, photographs and old Bermuda Railroad memorabilia. They gave a glimpse into life on the island in the 1930's and 1940's when the Bermuda Railroad operated. A half mile later, just before you get to Shelly Bay, you'll see old chimney ruins (pictured). They were the kiln for intense early to mid 19th century shipbuilding, when Bermuda sailing clippers were in demand globally. Now completed is a new Shelly Bay Pedestrian link, begun in 1992. It reconnected the long-severed trail from Stonehaven Road to Shelly Bay, at a cost of 418,000. It used a combination of new paths and six new aluminum bridges. The project took 18 months to complete and now walkers can go from Flatts Inlet all the way to Shelly Bay Beach. There, pass through the Nature Reserve, to Burch's Cove. From there, walk the North Shore Road again, for four hundred yards or so. Pick up the trail again past the Crawl Hill Esso Service Station, on the sea side. (Improvements in this area have been made). From here on, past the Clear View Suites and Villas buildings, the trail has magnificent seascapes all the way. 2013. December 7. A proposed pedestrian bridge between Winton Hill and Baileys Bay was approved despite several objections from residents. The bridge, completed in 2014 and made in the Dockyard, Sandy's Parish, creates a new amenity by linking sections of the Railway Trail. While the plans for the bridge were submitted by the Department of Parks, the project was funded through private donations through the assistance of the Friends of the Bermuda Railway Trail. Tucker Murphy, a spokesman for the group, said the bridge would create a 3.2km unbroken path which will increase the usage of the eastern end of the historic trail. The completed project would not only encourage exercise but carry cultural and tourism value, noting that it links numerous historical sites and boasts fantastic views of the area. To help satisfy some planning objections, the application was revised to reduce the visual impact on the surrounding area. Along with reducing the height of the handrails of the bridge from 54in to 42in, the revised application reduced the height of the pylons by two feet and that the bridge be raised further off the foreshore area outside of one property to allow improved access to the foreshore area beneath the bridge. And regarding security concerns, the landscaping plan was modified to create a natural barrier of Spanish bayonette, prickly pear and natal palms where the bridge is close to residential properties to deter illegal access to the properties. 2014. November 6. The final preparations are being made on the new footbridge (see below) being constructed at Bailey’s Bay. Tucker Murphy, on behalf of the Friends of Bermuda Railway, said it is hoped the bridge will be complete by the end of this month or the first week of December. “We have placed the last four spans last week and we still have to fill in gaps in the intermediate pieces that need to go in between,” he told The Royal Gazette. 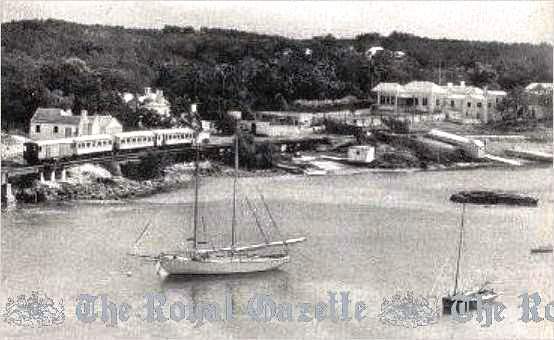 “We have taken the measurements and then there are a few more details; mainly the planting because some of the plants we put on the trail got taken out by the storms.” They also plan to host an official launch inviting Friends of Bermuda Railway members, sponsors and residents of Bailey’s Bay. 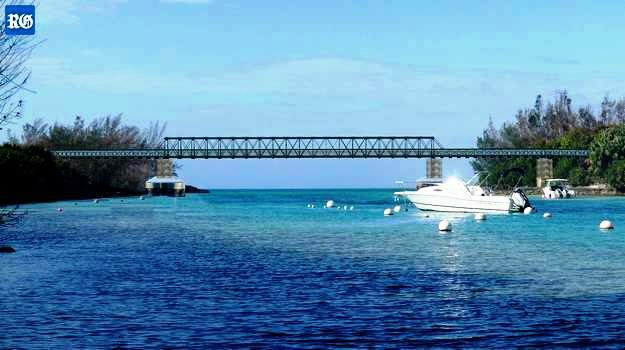 It is the second bridge construction organized by the Friends of Bermuda Railway, with support from donors, volunteer contributions and community support, the first bridge is at Winton Hill, about a quarter of a mile from Bailey’s Bay. The programme could also include bridge sections being put up at Coney Island and across Flatts inlet. There are a couple more diversions onto the North Shore Road, then the trail again, along Coney Island Road to near where Hamilton Parish meets Coney Island, in St. George's Parish. There is a lot more still to see but you have to go to St. George's Parish to see for yourself the magnificent North Shore views. The railway ended, going east, in the (now destroyed) station in the Town of St. George. Before you get there, at Ferry Reach in St. George's Parish is the old Astor estate. It got its name when American tycoon Vincent Astor - see http://en.wikipedia.org/wiki/Vincent_Astor - (1891-1959, son of John Astor who died on the Titanic) built an estate here, on the South Shore of Ferry Reach, at great expense in the 1930's. Astor was the major benefactor of the Bermuda Aquarium from 1926 and arranged most of the financing when it was at Agar's Island. His architect was Edward Durrell Stone. The property included a sprawling mansion and guest cottages, all still there, and a large boat house. Astor repeated his private railway building at his US estate and built a 2ft gauge (narrow gauge) railway train with 2 small purpose-built carriages, run by a Baldwin locomotive - see http://en.wikipedia.org/wiki/Baldwin_Locomotive_Works - which also made the carriages - which carried him and his guests over the hill to his own private station on the Bermuda Railway until the railway's death in 1948. 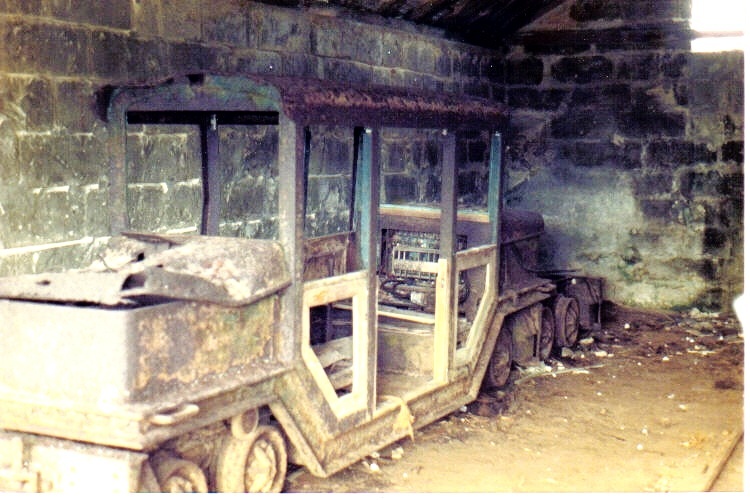 The remains of what looks like one carriage and the engine was photographed by this author in 2003 (see photographs below), clearly in an appalling condition, rusted out for decades. 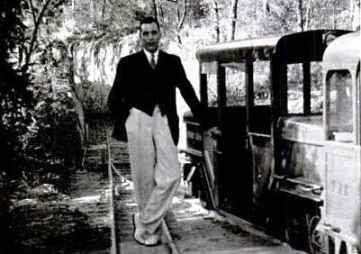 Beyond his property, Astor rented use of the railway track from the Bermuda railway operators to run his private guests to other parts of the island on periodic sightseeing trips, at times that did not conflict with those of the railway system. Some effort was begun in 1967 by then-owner Herbert Bierman in hopes of engine and carriage restoration but when he died in 1970 all work stopped and was not later resumed. Interestingly, at about the same time as the Astor railway was built, there was a similar-gauge small railway in the United Kingdom, the Lynton & Barnstaple Railway (L&BR) - now a Trust in the UK, with a similar or identical Baldwin locomotive, which was scrapped back in 1935. L&BR was restored in 1979 and now runs a steam service. When he died, the estate was sold to others. Another view of old building for Astor private railway. 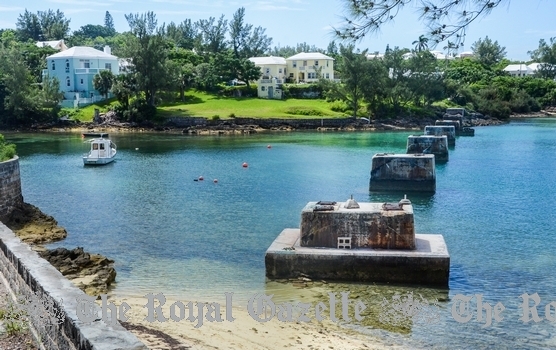 Photos by author Keith A. Forbes exclusively for and copyrighted by Bermuda Online. 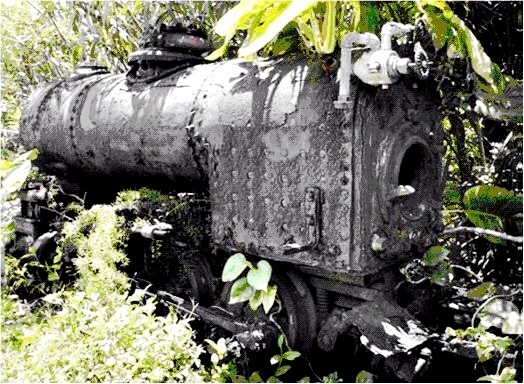 Today, these rust-ridden relics are the only rolling-stock remnants anywhere in Bermuda of both the original Astor Estate railway and the Bermuda Railway. It is hoped it is not too late now to have them restored as unique pieces of Bermuda railway history. In 1962, an RB-47 reconnaissance aircraft from the United States Air Force crashed on the property after taking off from the nearby Kindley Air Force Base and damaged some of the outbuildings. All four crew members perished. A prominent contemporary artist once painted scenes of the Bermuda Railroad. Mr. John Finch, a retired engineer who lived on the Isle of Wight in the United Kingdom used to come to Bermuda regularly to see his daughter Carolyn, an artist, when she lived here. His artistic renditions of the Bermuda Railway are historically correct and exquisite. One such work, "The Boat Train at Bailey's Bay," features a Bermuda Railroad train crossing the trestle bridge over Bailey's Bay in Hamilton Parish. It is complete with houses of the period near the trestle bridge. Railway Trail Guide and Map. 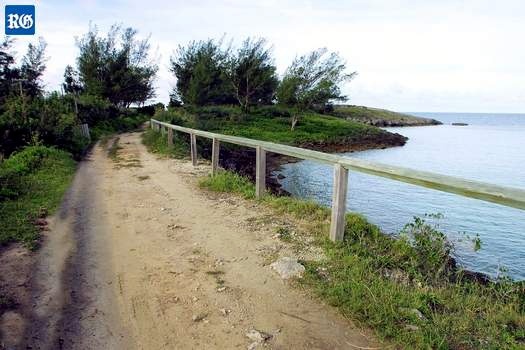 Published by the Bermuda Government's Department of Parks as the entire Trail is parkland. Not available online, only on arrival in Bermuda. Divides the Trail into seven sections, each of which takes 1 1/2 to 3 hours to walk, at times when the combination of heat and humidity particularly in summer do not adversely affect walkers or those on cycles that can be rented. Note that some parts of the railway trail no longer exist, such as the areas once in the City of Hamilton, Town of St. George, from Ferry Reach to Coney Island, some bridges over which the railway once ran, for example, over Flatts Inlet). For all enquiries about the Railway Trail not covered by this web file, including how to access it by cruise ship or airline visitors please consult the Visitors Information Centres in the City of Hamilton, or in Sandys Parish or Royal Naval Dockyard or Town of St. George, not this author. Bermuda in Three Colours. Book. Carveth Wells. 1935, Robert M. McBride & Company, New York. Includes two chapters on the Bermuda Railway. Bermuda: Seeing the Sights by Railway, Bermuda Railway Company, Ltd. 1936 Tourism brochure with the railway line as it was in the mid-1930s, describing every station, and also includes a fold-out map. Bermuda Railway by Simon Horn, Website. Friends of the Bermuda Railway Trail (FBRT). Hiking Bermuda. 2003. 20 Nature Walks and Day Hikes. Cecile and Stephen Davidson. 160 pages. Standard hiking book format. A guide to the back roads of Bermuda, including the Railway Trail. The Bermuda Railway, Gone But Not Forgotten. Book. Colin A. Pomeroy, 1993. History and operations, also information and photographs about rolling stock, stations, bridges and trestles, and other technical details. Rattle and Shake, The Story of the Bermuda Railway. Book. David F. Raine. Pompano Publications, 1992. ISBN 0-921962-08-8. Also with many historical photographs and pictures of the remains of the line still visible today. Bridge House Gallery, #1 Bridge Street, St. George's GE 01, Bermuda. 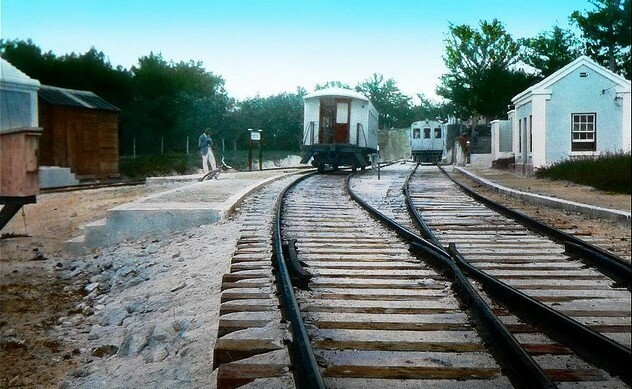 The Bermuda Railway. Brendan Hollis. Video, Triton Productions Limited, 1989. One of the About Bermuda television series. Includes an interesting interview with Bill Kitchen, son of the line's Chief Engineer, who also worked on the Railway before World War II.